As part of her responsibilities for the Detroit Lions, Tori works as the sideline reporter for the Lions’ preseason games that air on FOX2 and Fox Sports Detroit alongside play-by-play commentator Matt Shepard and color analyst Chris Spielman. During the 2018 NFL preseason, NFL Network selected Lions vs. Browns at Ford Field to appear live on their air in Week 4. 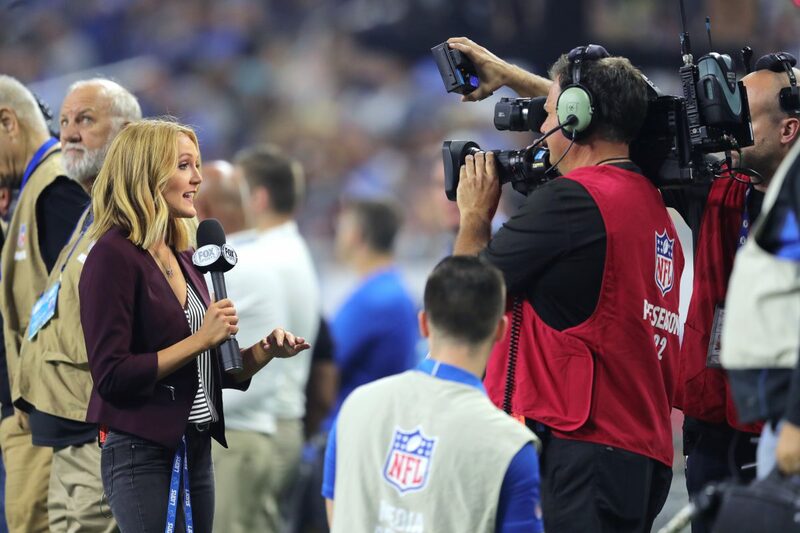 Since NFL Network broadcasts the home team’s feed, Tori and her crew were live on NFL Network to a national audience of 756,000 viewers as well as live locally on FOX2. Tori Petry is the multimedia journalist for the Detroit Lions where she serves as a sideline reporter, feature reporter, host and analyst for the team website, detroitlions.com. In addition to online content, she also conducts live post-game interviews on Fox Sports Detroit. In her spare time, she plays cornerback for the Detroit Dark Angels, a women's semi-pro tackle football league, and is currently enrolled in The Scouting Academy, a course for prospective pro football scouts. Tori Petry is the Emmy-nominated multimedia journalist for the Detroit Lions where she serves as a reporter, host and analyst for the team's TV partners and website, detroitlions.com. Outside of the NFL, she also works with Fox Sports Detroit as a sideline reporter for high school sports and other pro sports teams. Tori is an alumni of the Detroit Dark Angels, a women's semi-pro tackle football league.